Richard J. Anderson: For all my effluence about The Commercial Album, it was a bit of a flop. In response, The Residents decided they were going to do something “apocalyptic.” So, they created an album about an apocalypse, a disaster of biblical proportions. Inspired by tales of the Great Depression, they created the first album in what would become The Mole Trilogy: Mark of the Mole. A return to the storytelling, conceptual work of Not Available and Eskimo, Mark of the Mole tells the story of the Moles, a primitive people who toil in deep underground holes. One day, the sky falls and a massive storm floods their holes, forcing them to wander across a cruel, unforgiving land to the land of the lazy, decadent Chubs. There, the Moles are used as cheap labor until a Chub scientist comes up with a labor-saving machine. Out of work, the Chubs and the Moles end up breaking out in brutal, indecisive war. Again, though, The Residents punctured the pretentiousness of the project on the Mole Show Tour, wherein Penn Jillette, as a narrator, explained the plot for what would likely be confused audiences. Said narration often consisted of joking commentary on the story and performance, but this was all part of the act. There’s enough audio/visual documentation of these shows to explain for the curious, but the album that it started the whole project, retains its power even in the context of The Residents later works in the vein, including the other two albums in the Mole Trilogy… albums which are decidedly not continuations of the story. Like Eskimo, this is an album I love, but don’t put on much. It’s such an intense listening experience, that it requires active listening. Also, generally, when I want to hear the Mole stuff, I put on The Mole Show: Live in Holland instead. I find Penn Jillette’s narration to be a comforting sugar coating that offsets the darkness of the music and story. Don’t begin here, but definitely listen to this album in your Residents explorations. Especially since in a couple albums, we’ll be hitting one of the, uh, less good periods of Residents work. The Mole Trilogy is both one of the most interesting and frustrating things the Residents started on — mainly because from a great beginning, this and Tunes of Two Cities, the next album — they kind of went off the rails. The Mole Show CD is great, except the mastering is kinda lousy and the mix is really muddy. The original VHS of the show is absolutely terrible — a few murky shots of the Residents on stage playing in the dark with a lot of really awful computer animation over the top. It’s less a document of what was likely an amazing show and a demo reel of what not to do with your brand new Video Toaster. (The limited edition DVD that Ralph America put out in their last days was pretty good though and actually let you SEE WHAT WAS GOING ON ON STAGE.) And, well, then there’s The Big Bubble, which we’ll get to pretty soon, but, SPOILER ALERT: Great ideas don’t always transfer over into great albums. The Residents also did finally do a Part 3 of the Mole Trilogy, but it was just a 10 minute thing, and didn’t really… do much for the story. Too bad, as the setup for the story in Mark of the Mole (and the little bit alluded to in The Big Bubble) is great and could potentially have been a great work of art about the nature of humanity, immigration, culture versus subculture and all that sort of stuff. As is, we get a great foundation with Mark and Tunes, but a shack thrown on the top. Aila: Mark Of The Mole is probably the best of The Residents clear ‘concept’ albums I’ve heard so far. It’s certainly a step up in terms of attention required, compared to the previous album The Commercial Album, but I think there’s enough of a payoff in the music to make that sort ‘active listening’ worthwhile. When I first started listening to this album, even on the first track (which is a bit of a deviation from the rest of the album), the first thing I thought was ‘this is quite a bit like Eskimo.’ When the second track came on, I thought ‘this sounds EXACTLY like Eskimo.” Then I realized my iTunes was on shuffle and it WAS a track from Eskimo. Go, me! When I got back to the actual record though, that feeling did persist somewhat. The closest relative to this record in terms of The Residents repertoire is definitely Eskimo. That said, this album is a lot more cohesive than Eskimo, there are things that sound more like songs on it, and the narrative is a bit easier to follow (insofar as you can actually kind of pick up on it without reading a large text). The story that this album establishes (to be continued on further records I’ve yet to hear, apparently) is nothing groundbreaking, but it’s done fairly well. It concerns two groups of people (? ), The Moles and The Chubs. The Moles are the hard-working types (essentially the working class) who are forced to abandon their home after a natural disaster, which is introduced in the lead-off track “Voices From The Air,” and continued in “The Ultimate Disaster.” They are then forced to migrate to the land of The Chubs (told, fittingly, in “Migration”), who are of course the total opposite to the Moles in terms of work ethic and lifestyle. The Moles then get exploited by The Chubs for a while before The Chubs decide to replace their labor with a machine, which is something I probably wouldn’t have gleaned without further investigation and the title of the track “The New Machine.” This inevitably leads to a conflict, apparently to be continued, which is told in part on the final track, “The Final Confrontation.” The music on all these tracks is pretty typical of The Residents, but it’s done in a way that seems to flow really well, better than on a lot of previous albums. This isn’t really an album you can just pick up and listen to a song at a time out of context without being really familiar with the album to begin with, but it is very interesting and worth listening to and paying attention. 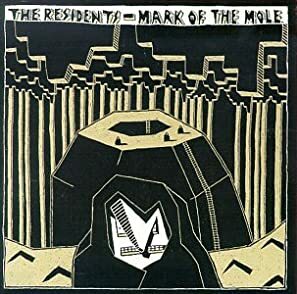 Mark Of The Mole is one of the better Residents albums I’ve heard so far. I’m certainly looking forward to hearing the next part, but on its own this is a pretty good album in a non-traditional sense. It definitely isn’t a great introduction to the band, but it’s a nice example of what they’re capable of in terms of a longer form ‘audio play’ of sorts. I’m pretty sure I’ll listen to this again at some point, but it won’t be in heavy rotation (well, none of The Residents are really in heavy rotation for me to be honest, but the point is this doesn’t offer a lot in the way of instant gratification).